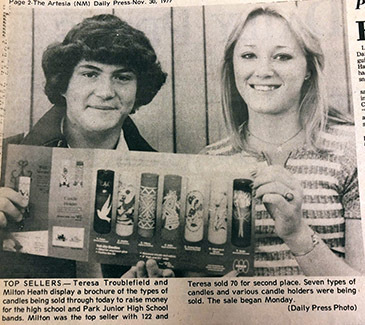 Looking back 40, 30 and 20 years ago, the following are excerpts from the Artesia Daily Press from Dec. 3-9. As reported in the Pinon News: Travis and Ted Eldrige and Basil Holcomb have been busy the past week riding fence lines, moving cattle, and other jobs, as the Pinon Draw cattle have been getting in Basil’s pasture. They found no fence down or no gates open, so they think some hunter must have left the gates open when they went through, then shut them when they came back. Members of the Hospital Auxiliary have been refurbishing and dressing used dolls to be sold at the Thrift Shop. The proceeds from the sale of the dolls will go toward the purchase of bronchoscopy equipment for Artesia General Hospital. Persons to clothe the dolls include Jaynie Beadle, JoLyn Bloomer, Jean Bullock, Louise Bush, Toni Bratcher, Cindy Franklin, Jan Johnston, Corinne Lanning, Sally Lanning, Helen Mapes, Marie Morten and Debbie Padon. Several Artesia area farmers have scheduled a meeting to make plans for joining a parade in Albuquerque next month designed to protest what farmers say are unfair prices for their produce. About 12-15 tractors from the Artesia area are already committed to the parade, farmer Don Thigpen of Cottonwood said. He said area producers will gather at Jackson’s Restaurant to make plans and hear speakers from the original American Agriculture movement. Large tractor parades protesting low farm produce prices have already been held in Colorado and Georgia, and farmers throughout the country have planned others. Future Homemakers of America students at Lake Arthur High School recently held a “Mr. Irresistible” project to raise money. Each girl ws to give a boy a paper heart before she spoke to him and if she forgot she had to donate three cents. The boy with the most money at the end of the day was crowned for the honor. Brian Lilly was crowned for the honor. Runners-up were Jimmy Salcido and Mark Crook. As reported in the Pinon News: Mr. and Mrs. Basil Holcomb were about two miles from their home Monday of last week when their pickup quit and Basil was unable to get it started again, so Mrs. Holcomb walked back to their home to get another pickup to pull the pickup back to the house. After she had been gone quite some time, two hunters, Bob Stafford and Kuebel Apiaries from Boerne, Texas, saw Basil working on his pickup and went to him to see if he needed help. They found the trouble was a short but did not find it, so they tied on to it and pulled it Basil’s house and arrived there just as Mrs. Holcomb did. She was very appreciative, as she hates so much to pull a car. Selected to the Southeastern New Mexico Music Educators Association All-District Honor Band recently are Artesia musicians Todd Richardson, trumpet; Luis Marrufo, tuba; Ricky Swafford, French horn; Ricky wiles, baritone; and Luis Perez, percussion. All are students at Artesia High School except Perez, who is a student at Artesia Junior High School. They competed with more than 300 students from throughout Southeastern New Mexico. They will participate in the All-District Honor Concert at Hobbs High School Auditorium. As reported in the Pinon News: Mr. and Mrs. Pete Peters of Artesia, had their son, Chase Peters, his wife and two little sons came from a long distance from the Northwest, Tuesday in their trailer house for a visit. They became ill soon after arriving at the peters home in Artesia. They thought it was from the gas so they went to Mayhill to a campground there and soon became all right. Mr. and Mrs. Pete Peters have been going up there each morning to meet them and be with them. They all went to the Weed and Avis area Thanksgiving Day sightseeing and planned to go out somewhere and have Thanksgiving dinner somewhere, during the day.